On the run: Grace Kelly looks to make ground for Mayo. Photo: Sportsfile. Mayo fell to a third league defeat in four games in MacHale Park on Saturday night with Galway running out 1-11 to 0-8 winners. Mayo manager Peter Leahy made use of the unlimited subs rule during the league bringing on ten replacements before the end of the game to give his squad as much game time experience as he could. Despite playing with the aid of a gale force breeze in the first half Mayo went in trailing by 0-6 to 0-4 against Galway on Saturday night. Peter Leahy’s charges did lead one chart at the break kicking six wides to Galway’s one in the opening half an hour - as a far more efficient and ruthless Galway side took the majority of their chances when they presented themselves. The Tribeswomen raced out into a 0-3 to 0-0 lead inside the opening four minutes with Olivia Divilly opening the scoring with the other two points coming from Roisin Leonard and Tracy Leonard with a placed ball. Mayo got the ball rolling on their scoreboard six minutes in when Niamh Kelly kicked the first of two first half points she would kick, that was speedily followed by a pointed from from his sister Grace to cut the gap back to one. 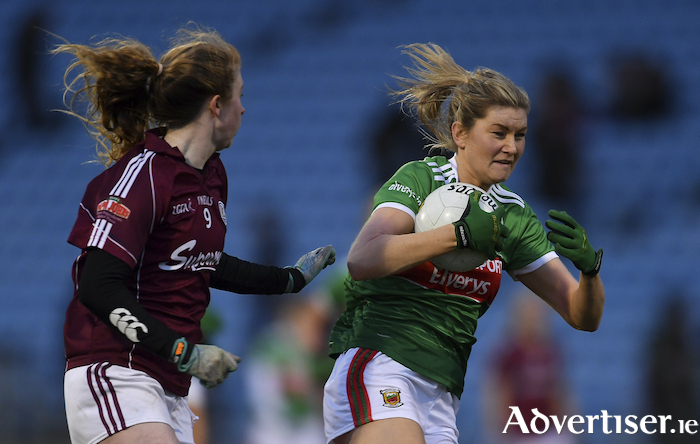 Roisin Leonard made it 0-4 to 0-2 with a well taken point ten minutes in, but Mayo rallied with Niamh and Grace Kelly both landing points to level the game up at 0-4 0-4 with 15 minutes gone. They were unable to push on, on the scoreboard before the break with Galway kicking the final two scores of the half rom Mairead Seoighe and Louise Ward. Mayo’s task was also made harder with the loss of Danielle Caldwell to injury ten minutes from the short whistle with the Castlebar Mitchels player replaced by Ciara McManamon. Mayo had the game level inside four minutes of the restart with Natasha Gaughan kicking two close range frees after coming on as a half time sub. Galway were struggling with their shooting with the breeze as Mayo did in the first half kicking four wides inside the first six minutes and dropping another two short. The did however manage to stick home the first goal of the game eight minutes in when Sarah Conneally was played in at the end of a flowing move by Roisin Leonard and hammered the ball home to the top corner to put Galway three clear. Mayo thought they were in for a goal when Fiona Doherty picked out a Galway pass and headed for goal, she picked out Grace Kelly on her shoulder but Fabienne Cooney got back to get a great hand in to clear the danger. Sorcha Murphy was forced to pull off a top drawer save from Roisin Leonard down the other end seconds later after Galway broke with power and purpose. As the game reached the three quarter mark, Gaughan and Tracey Leonard swapped points frees to keep Galway three points clear and Mayo still chasing the game. Conneally put four between the teams with 11 minutes to go with a top class score from out on the right, and Galway pushed themselves six clear thanks to points from Tracey and Roisin Leonard - with Tamara O’Connor pulling one back for Mayo as the game moved into injury time. Galway sub Aoife Thompson kicked her sides 11th point from close range four minutes into injury time to put a full stop on the encounter.